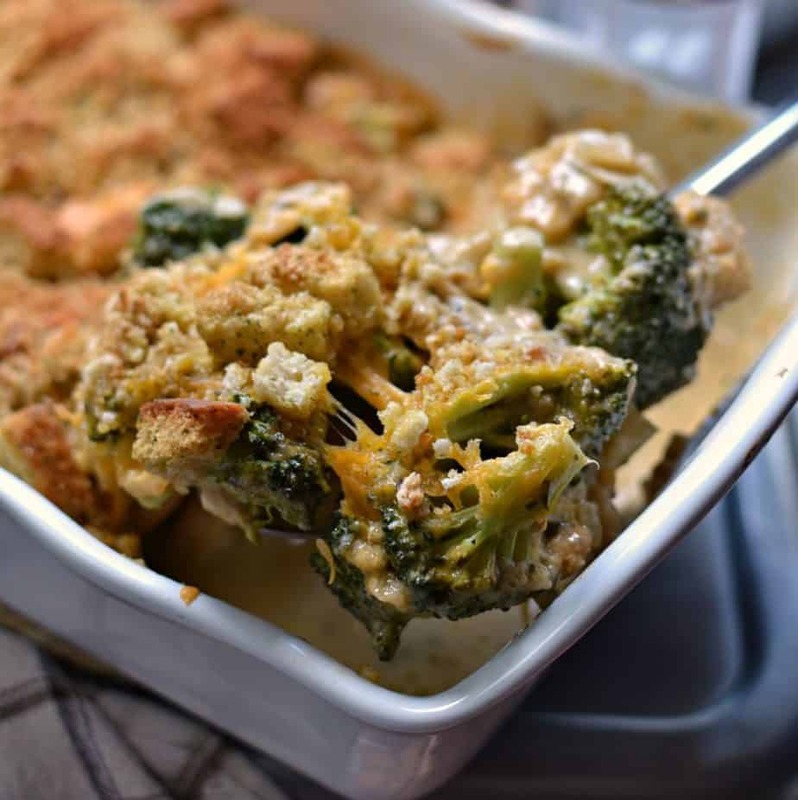 CHICKEN DIVAN RECIPE IS TENDER PIECES OF CHICKEN AND BROCCOLI COMBINED WITH GOLDEN BROWN MUSHROOMS AND SHALLOTS IN A CREAMY MORNAY CHEDDAR SAUCE TOPPED WITH CRUSHED SEASONED CROUTONS. This is one of my picky sons favorite casseroles and is an easy weeknight meal. Leftovers (if you are lucky enough) are delicious as well. Life just got a heck of a lot busier with the school year starting back up. The slow paced days of summer are gone and now we are into the busy season. Before you know it the holidays will be rolling in here and it will be increasingly busier. As I always say during the holiday season “Run run Rudolph!” This time of the year is perfect for casserole dishes like Chicken Divan Recipe. This beauty takes no time at all to whip up in just a few easy steps. Are you in a super big hurry? Prepare it ahead of time and store it covered in the refrigerator. It is also what I like to call a forgiving casserole in the fact that sometimes it takes this family a good forty minutes to get to the table and it tastes as good then as when I first popped it out of the oven. I am sure that if your house is anything like mine you know exactly what a forgiving casserole is. 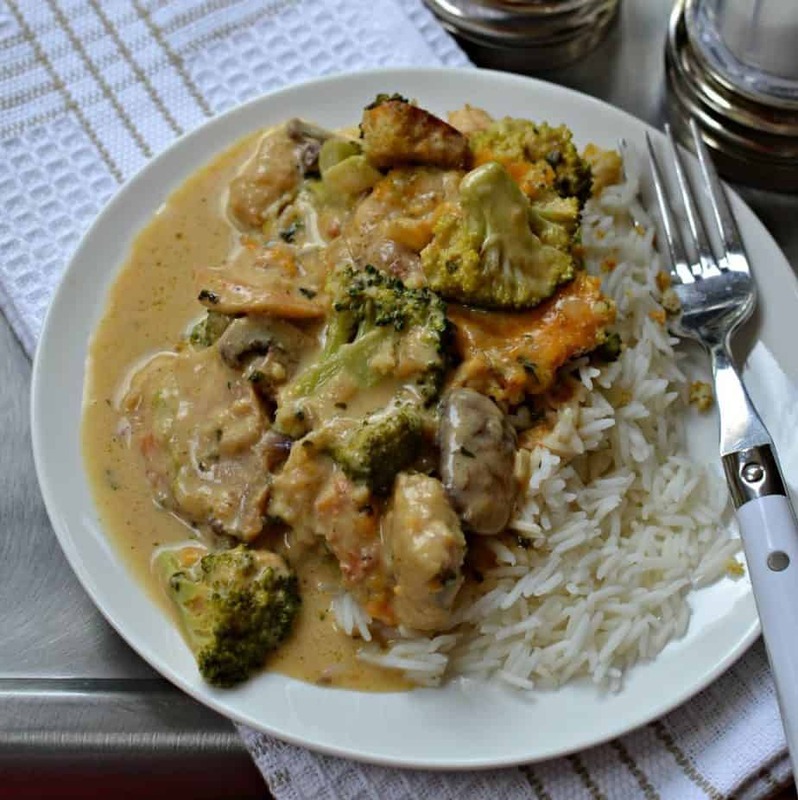 Chicken Divan Recipe is a chicken casserole dish with broccoli, shallots and mushrooms in a creamy Mornay sauce. Mornay sauce is made from adding shredded cheese to a bechamel sauce. I know all of this sounds complicated but it really isn’t. Many of the quick versions call for canned soup for this casserole but this one does not. I am not fond of creamed canned soups at all. OTHER CASSEROLE DISHES YOU WILL LOVE! 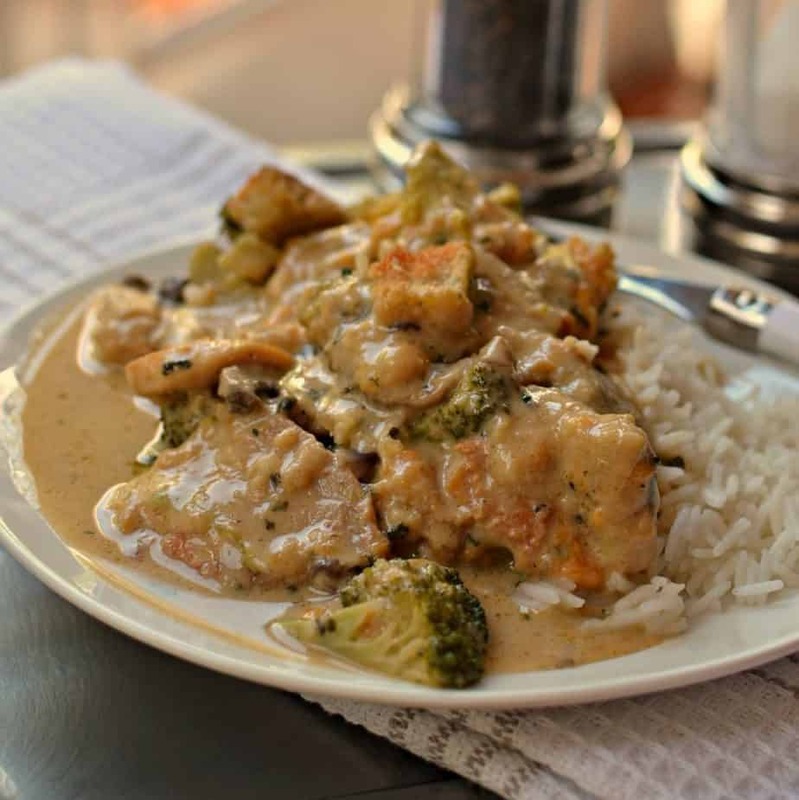 Chicken Divan Recipe is tender pieces of chicken and broccoli combined with mushrooms and shallots in a creamy Mornay cheddar sauce topped with croutons. In large skillet over medium heat add 1 tablespoon butter and 1 tablespoon olive oil. Cook chicken in single layer; lightly browning on each side. Remove to plate. Repeat if necessary; working in batches. Set skillet aside. Add broccoli and water to large microwavable bowl. Cover with wet paper towel and microwave for 2 1/2 minutes or until crispy tender. Drain well in colander. In same skillet that you set aside melt 2 tablespoons of butter over medium heat. Add mushrooms and shallots. Cook until lightly browned; approximately 8-10 minutes. 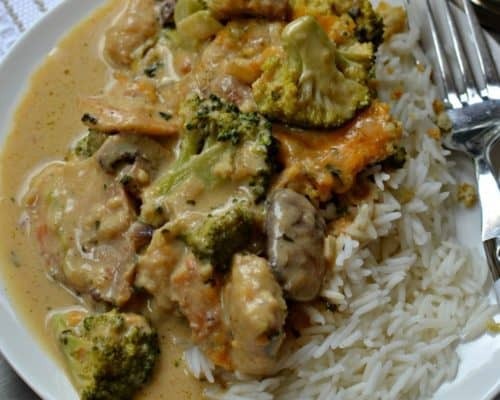 Sprinkle vegetables with flour, dried parsley and nutmeg; cook for 30 seconds stirring continuously. Slowly add milk and chicken broth alternating between the two and stirring continuously. Reduce heat to medium low and continue cooking until thickened approximately 7-10 minutes; stirring frequently. Remove from heat and stir in 1 cup cheddar, shredded jack cheese, sour cream and salt and pepper. Fold in chicken and well drained broccoli. Spoon into casserole dish. Melt 2 tablespoons of butter in medium microwavable bowl. Add croutons and remaining cheddar. Stir to coat. Sprinkle over casserole. Bake at 375 degrees for 25-30 minutes or until lightly browned. Cool for 20 minutes. If desired serve over rice or noodles.